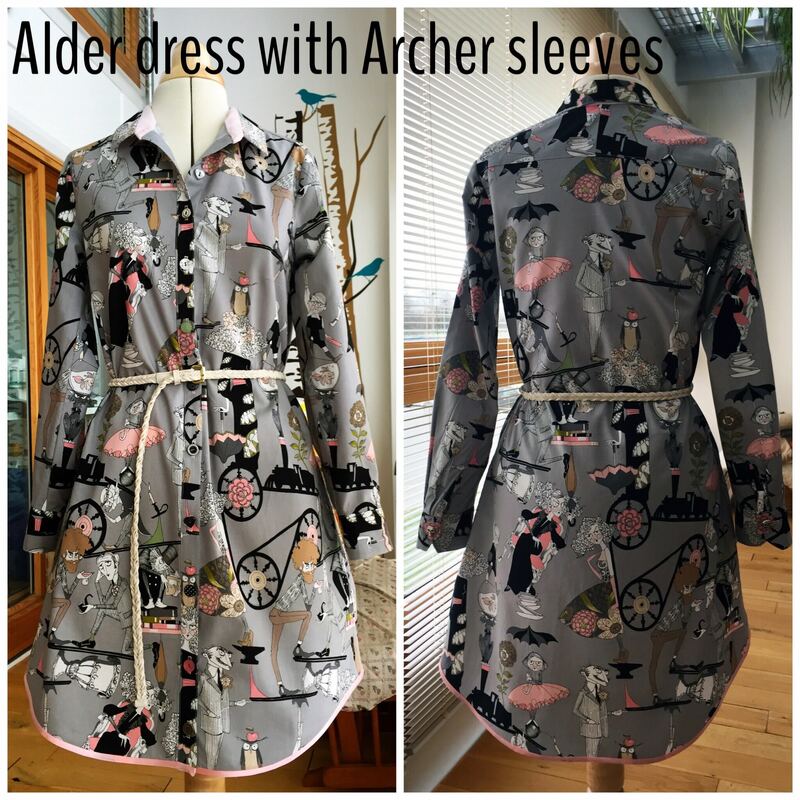 I have just finished Grainline Studios’ Alder Shirtdress, version A, with added sleeves from the Archer Button Up Shirt and I love it! This dress has a few firsts for me- plackets, collar, cuffs and multiple button placement are all new. 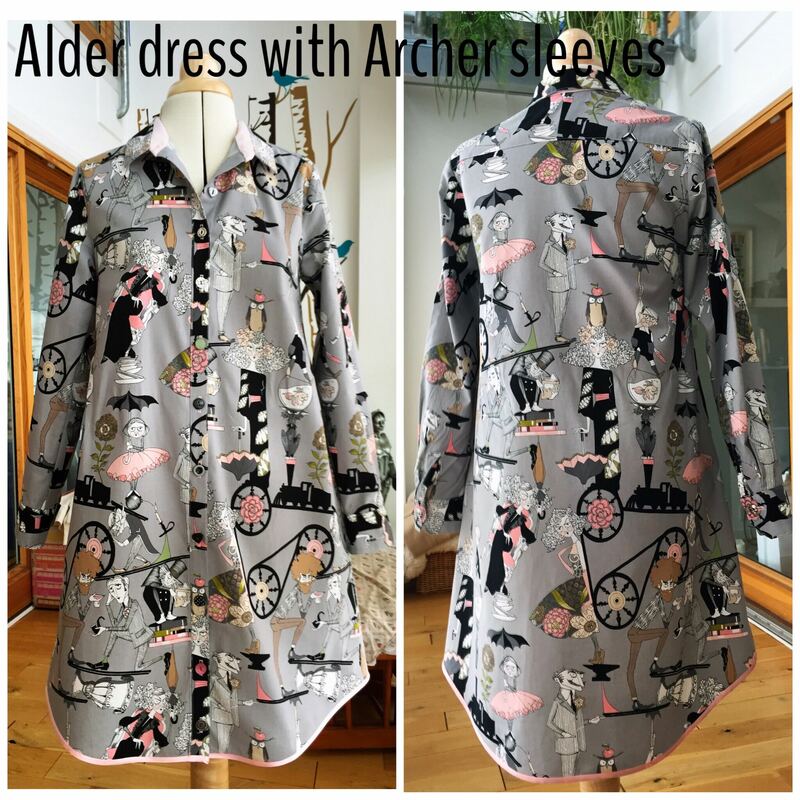 I used the instructions from the Alder sewalong which has a post on adapting the Archer sleeves to work with the Alder. Great instructions and loads of photos made this an easy Saturday afternoon of pattern drafting. I did out a calico toile together because I wanted to check the fit, sleeve placement and because there were quite a few new techniques in here for me. It was pretty easy to put together and the fit was good so I did very little other than moving the dart position slightly. It took a while to choose fabric for this and I went into the store having decided that I definitely wanted to make a dark denim shirt dress. 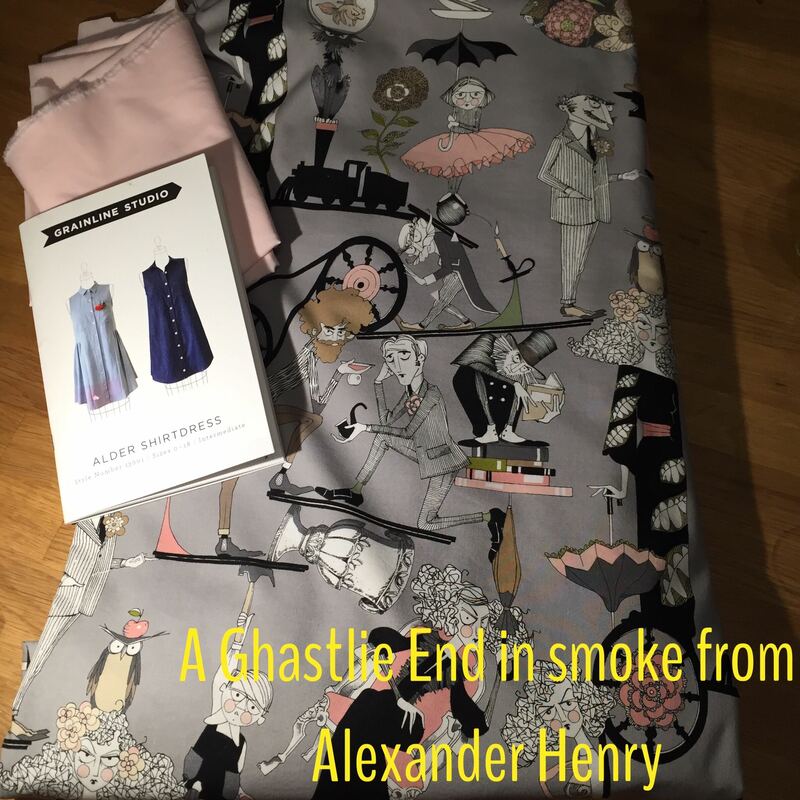 However, as often happens when I go into Mandors, I ended up choosing something completely, utterly and totally different…A Ghastlie End from Alexander Henry fabrics. The pattern placement and cutting took me ages with this. I cut one piece at a time because it wasn’t so much about pattern matching but about the placement of the pieces to get the figures to appear where I wanted them on the finished dress. I ended up cutting a 2 piece upper collar and 2 piece outer yoke to get it to work. Such a satisfying process and I would happily tackle a fabric like this again after doing it. I managed to get the same figure on the collar, cuffs, button band and cuff plackets- yaaaay! The sewing up was pretty straight forward. I used a different technique to attach the collar from Andrea’s Four Square Walls site which I found easier than the sandwich method I used on the toile. I also added in seam pockets using the pattern piece from Colette’s Peony– I love a dress with pockets. 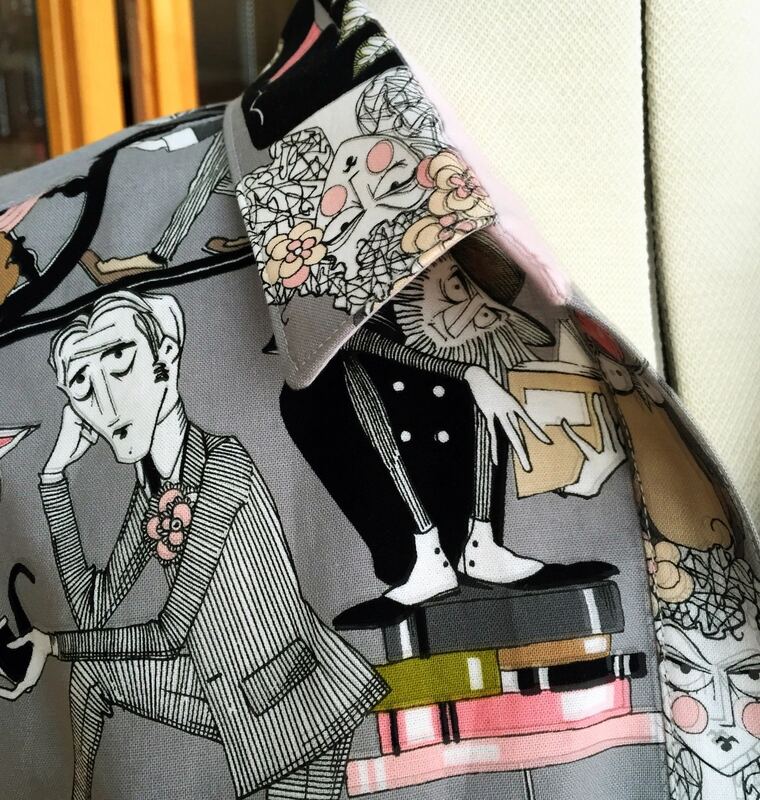 The little man peeping out from under the collar makes me very happy. I saw the pink satin bias binding in John Lewis and it is the perfect colour. I’m really pleased with the way it finished the bottom edge but it frays really badly so I can see it needing to be replaced at some point further down the line. I probably should have just made some but the colour is soooo good. I’m generally indecisive about button so using all different ones is my usual solution. The only ones I knew had to be in there were the 2 little silver skulls which I put on the cuffs. I can’t wait to wear this dress. 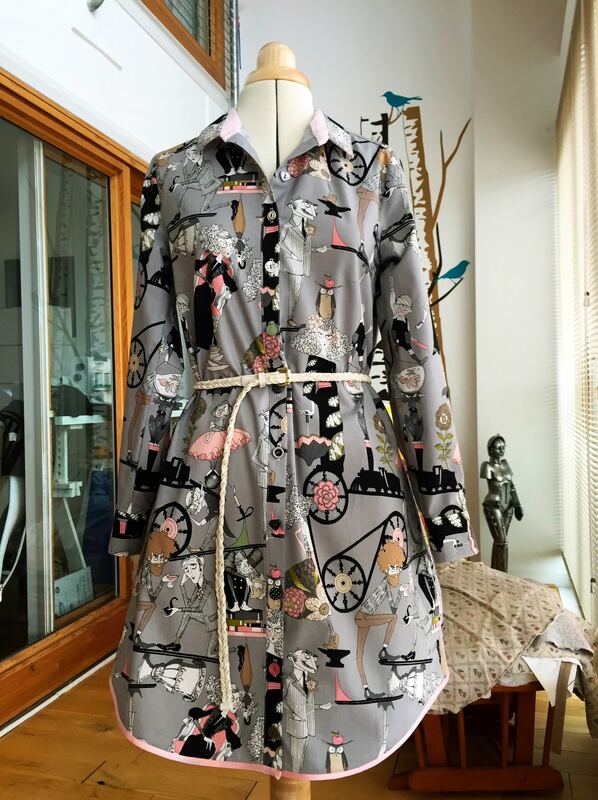 It looks great with and without the belt, with or without a black cardi and with boots or flats…so many possibilities. I really love the Grainline patterns and have made several of them in different versions since this one, including a view B with the gathered skirt in double gauze. I’ve also made three Scout Tees. I added a split back detail to two, one in Japanese crepe and the other in a cotton print. The third was made in a heavier fabric an all cut on the bias. There’s a couple of Tiny Pocket Tanks, one in Liberty and the other in a left over piece of Cotton and Steel rayon. I’m adding a Talvikki/Linden mash-up in a gorgeous French Terry and an Archer popover variation in double gauze to the list too. 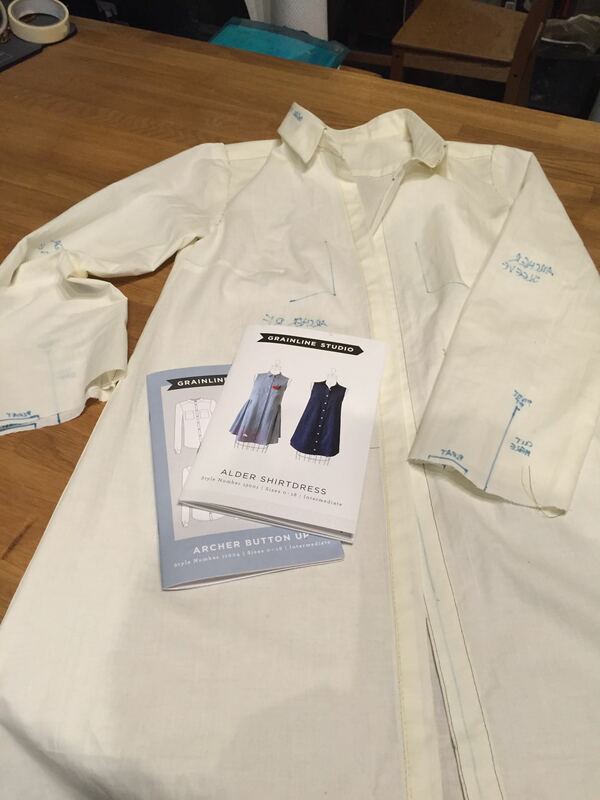 They are just really well drafted patterns with great online construction support via the sew-alongs. 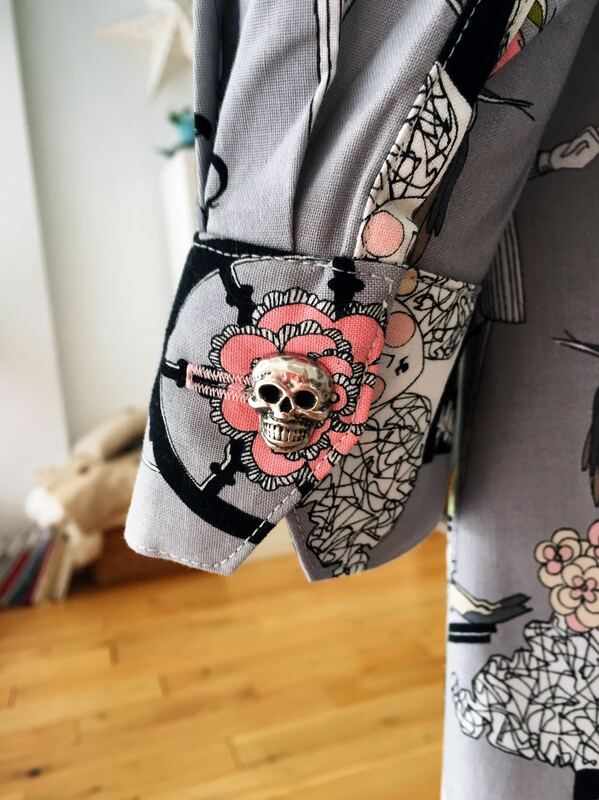 Wow – love this fabric! 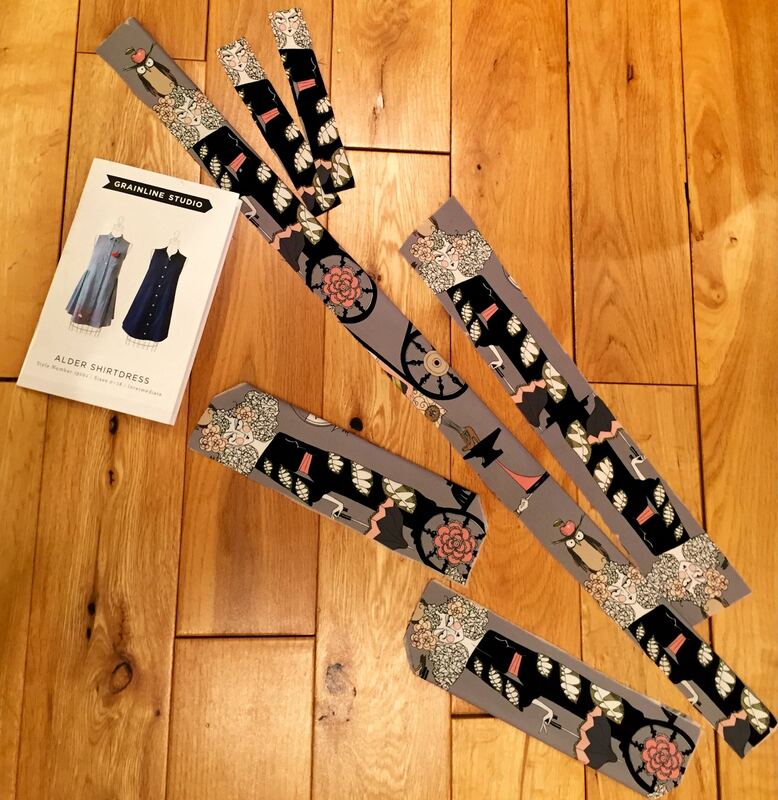 Great looking dress – very good pattern placement. Thanks Noelle! I just couldn’t walk by it :-). Loving Lindens on your blog. Haven’t bought that pattern yet but I think it’s just a matter of time!